This room’s theme is the iconic landmark’s Azure Window. The room enjoys an open-air balcony overlooking the internal courtyard. 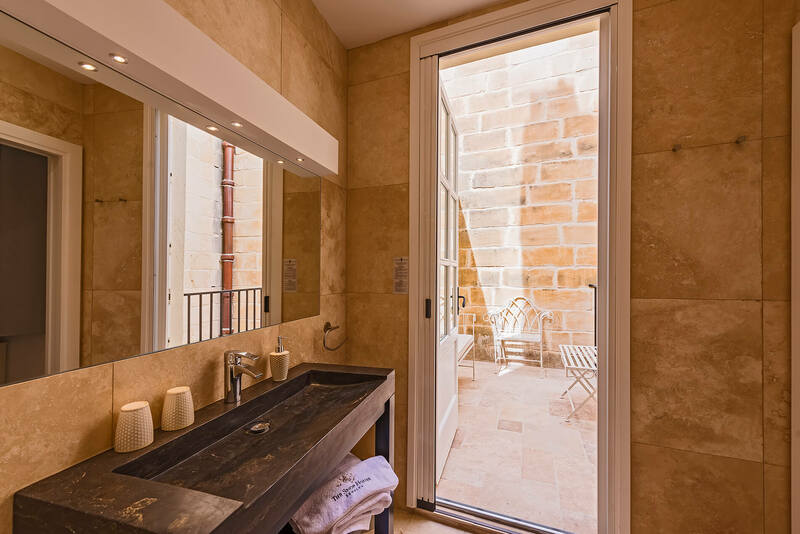 The decoration is inspired by the characteristic Maltese houses built with the indigenous ochre stones. Second floor and accessible by the lift or by the large internal staircase. It is situated at the rear of the house. It has a balcony of six square meters equipped with outdoor furniture. The decor is dedicated to the pastoral beauties of Malta expressed through a mix of contemporary art and timeless designer furniture. Double bed (160 x200), private bathroom with shower and WC, wardrobe, console desk, AC, Wi-Fi, minibar, kettle, safety box, hair dryer, luggage rack, international plug, USB plug. Minimum stay: three nights unless otherwise specified. All extra costs (taxi, booked tickets for hypogeum or shows or other activities) can be paid by credit cards (Visa, MasterCard, Diners International Cards).